Today's the day that SIENNA is having her  P A R T Y!! This is such a fun party to organise. Gather all your teddy bears and encourage your guests to bring theirs and have a wonderful party with lots of cute and cuddly best friends! You can source similar invitations from The Party Cupboard for $6.00 for an 8 pack. As for the food, it was anything Teddy Bear! We had tiny teddy biscuits, gummi bears, the large teddy biscuits from Arnotts etc. Honey Joys – because what do bears love most – HONEY! As the guests were arriving we had an easy teddy bear craft set up at the dining room table for them to do. This was a good warm-up activity and allowed guests to settle in as we waited for everyone to arrive. You can find the Teddy Bear Paper Craft Template here. We also had some name tags ready for the guests and one to pin on their teddy too. Along the lines of duck, duck, goose – you have all the guests sitting in a circle and one person going around and tapping them on the head saying “Teddy, Teddy, Teddy, Teddy” and when they say “BEAR!” the person who has been tapped, jumps up and tries to catch the person who is up before they return to their spot. This is a fun one to do. Have a large print out of a teddy bear and then have the guests blindfolded and they have to try and pin (bluetac) the bow tie to the teddy. Run exactly the same as a normal pass the parcel game but guests all have their teddy on their lap as if the teddy is passing the parcel. Under each layer of wrapping was a small packet of tiny teddy biscuits! We also used all “Teddy Bear” music. As well as the ever popular Teddy Bears Picnic song we used Teddy Bear, Teddy Bear, Turn Around….and Teddy Bear Twist etc. There are loads of songs that mention Teddy Bears in them. We stuck with teddy bears and lots of red & white checked gingham for our theme. The table cloths were gingham and we also had a picnic rug set up downstairs for the games. We had bunting, balloons, paper plates & serviettes all in red & white to make the house festive. We also had party hats with teddy bears on them for each guest to wear during the party. We used small picnic baskets as the party bags and when I say they were small, I mean tiny. The bonus is you can’t fit too much into them haha. They look absolutely adorable to give to your guests at the end of the party as thank you gifts. They are available online at Couple of Favours. 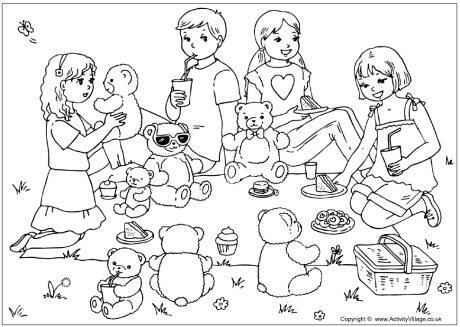 We also included a colouring in of the Teddy Bears Picnic with a print out of the music & lyrics to the song. 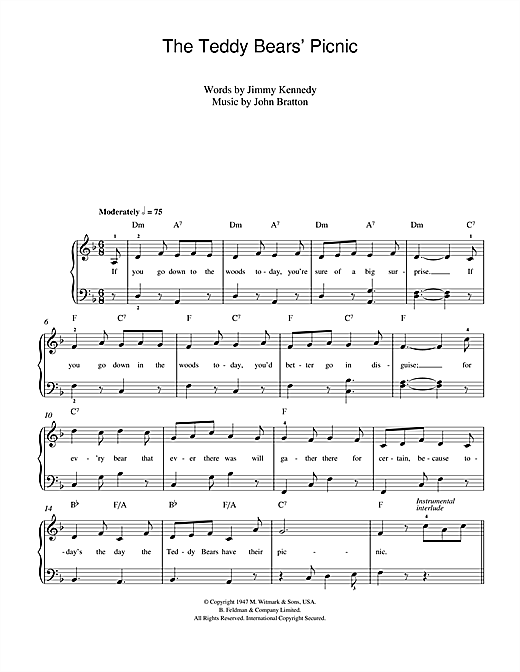 The colouring in is available as a download here and the music and lyrics is here. We rolled these up as a scroll and handed them out to each guest with their picnic baskets. My daughter had such a fun time at this party. It is a simple concept at heart. Her friends loved bringing along their favourite teddy bear with them. The games were kept simple and lighthearted and all in all, it was a great way to celebrate her 5th birthday.